I was planning on making a lasagna. And even though the pasta rolling machine happens to be out, I couldn’t get in the mood to make the pasta sheets. So when I was at the grocery store buying eggs (again! Why are we always out of eggs?!) I swung by the deli aisle where the packaged ‘fresh’ pasta was on display. Except the row of lasagne noodles was empty. Back home, now the following day, I still didn’t feel like mixing and cranking pasta dough so I decided to just do a baked rigatoni. Until my pantry only had linguine and farfalle! Argh! Could we not just get some baked pasta this week? Baked farfalle it is then, I decided. The first bit of news is it turned out really well. Cheesy, but not stringy from the mozzarella nor dry from the ricotta. Also, I seasoned the cheese mix and planned to top the whole pan with toasted garlic breadcrumbs so I didn’t make a sauce. I simply puréed good tomatoes (packed in purée) and used that as sauce. Which was a bit of a gamble, I know, but it was fine! Usually I make a nice sauce, quickly simmered with onion and carrot but not this time. Which is why this is the easiest baked pasta. The second piece of good news is I’m going to share the recipe and technique here. 300g ricotta (I used about 3/4 of a 400g tub) *you could use less, but, alternately, if you want to use the whole container and it’s quite a bit more than 300g, be sure to add extra sauce or the pasta will become too dry when it bakes. In a medium mixing bowl beat the 2 eggs with the ricotta, salt and pepper, then add the grated mozzarella and stir that in as well. Set this aside. Meanwhile, once the water is bubbling and boiling, add the pasta and set the timer. I usually set the timer for 2 minutes less than the recommended time on the package and taste to see if its cooked to my liking or needs more time; for the baked pasta I set the timer for an additional 2 minutes less, so 4 minutes less than the suggested time. It should be cooked, and not unpleasant, but not fully cooked. The tomato is going to soak in, too, as the whole thing bakes in the oven. Once the pasta is cooked and drained, put it back into the pot (not on the stove) and stir in the tomatoes. Then add the cheese mix and stir again so everything is coated. 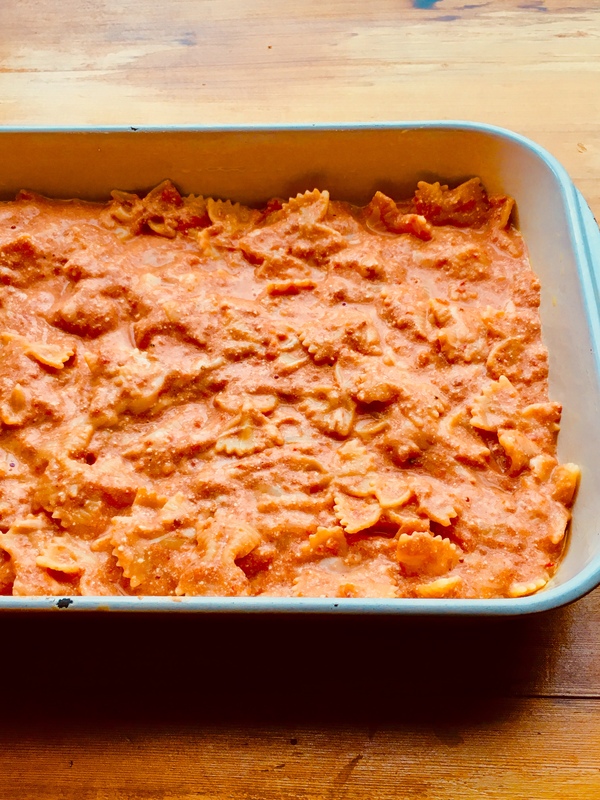 Pour the cheesy, tomato-y pasta (it will look like it’s coated in a thick rose sauce) into the prepared pan and bake for 35 minutes, covered with foil. After the 35 minutes, remove the foil, sprinkle the garlic breadcrumbs evenly over all the pasta and return to the oven for 5 additional minutes.